Much to do, much to do. I've been sketching and stitching and writing and rewriting and sketching and stitching and ....whew! Here's a sneaky peeky of one of the projects that will be in my Fabled Fusions book due out in September. Oh, I have also found the most wonderful fusible web in the world! Yes, the world! It's called Soft Fuse. 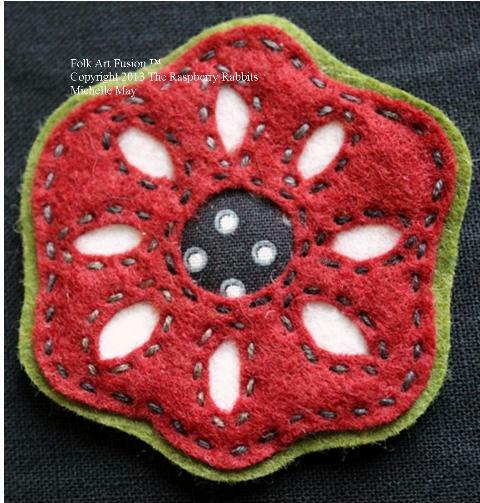 I love fusible web because everything stays put when you stitch. I've tried freezer paper and pins and glue sticks, but everything still wiggles around and drives me nuts. I stick myself a million times and glue myself to my quilt! hee,hee,hee. My issue with fusible web has always been that it can be too heavy, or make my needles gummy. Well let me tell ya, Soft Fuse is perfect in every way! It's paper backed, lightweight and no sticky mess. My hand needles glide right though it and all my pieces stay put where I iron them. Yippeee!!! I'm carrying it now in my shop. You can get some in a package or purchase it by the roll. You'll love it. Have a fun day! We'll see you back here on Friday. Hello there! Did you have a fun weekend? Are you working on anything new? I always have to have something for my hands to do. A figeting bunny I am. I guess that's one reason I like hand stitching so much as it goes wherever I go. 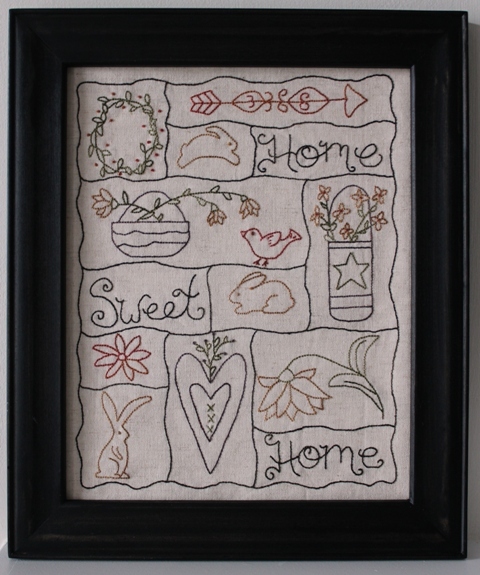 This is my "Sampling of Home" stitchery. It's lots of fun to stitch. It measures 8" x 10" so it looks great in a ready made frame. The floss colors came from my "Folk Art Fusion" Valdani, 3 strand collection. 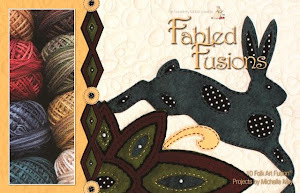 A lot of these colors will be used in my new book Fabled Fusions due out in September. In sincere appreciation and heart felt thanks to all my customers, I'm offering this pattern for FREE, yes, FREE if you purchase my floss collection (I only have 18 left). That's right. Purchase the floss collection and get the pattern for Free! Click Here! This pattern is not sold individually. Ok, so here's a little Lindsey music on Monday to start your week on an upbeat and happy note. Dance, create, play and smile really big! We'll see you right back here on Wednesday. "Hey man. Nice quilt you got there." "Oh, thank you! My Mama made it for me." Harrington, Mama is so dorky thinking those inanimate bunnies can talk. She knows darn well that only real bunnies can talk. Hoppy Friday! Have a wonderful weekend. Stay warm and we'll see you right back here on Monday. A Beautiful Shop and a Winner! A few weeks ago, I spent a Saturday with my dear friend, Bridgette. She and I love to go to antique stores together and explore little towns and the local shops that are in them. We went to downtown Apex, NC and that is where we came upon Lilly's. BE STILL MY HEART! Ok...so just the front entrance made me start to hyperventilate. Love the lights, love the greenery, love the wooden archway! I asked the two delightful, fun and charming fellas, working there (who I did not get a photo of, Duh!) if I could take photos to share with you. They said, "Sure!" with big smiles. Yes! Happy Bunny Dance! The displays were absolutely incredible. I really, really, really wanted this chest of drawers. Like really! It would be so great when David asks me for the millionth time "Where's the so in so?" I could reply, "In number 5." Brilliant huh? I loved how they tucked little lamps on shelves. The whole store felt so warm and welcoming with the soft glow of the lamps. I realize that fluorescent light bulbs are more efficient, but they are ugly and the light is cold, harsh and well, ugly. I shall miss the soft, warm, glow of incandescent light bulbs. I can't believe they are no longer making them. Poo! A garden cart with birdhouses and bunnies. Sweet! "Hey Bob, who's the lady with the camera?" "I don't know, but I hope she gets my best side." Love this cupboard, those lamps and the coffee sign. "Hold me Mama! I'm scared of the paparazzi bunny lady!" I have a thing for "Home" signs. Loved this one. Very clever. And finally, I would like you to meet Calla and Lilly. Yes, they are real and they live in the shop! Lucky birds! Their cage is huge. It's hard to tell from this photo, but it is huge. It was truly magical and fun here. Did you see anything you would want to take home? Do be sure and visit them if you are ever in Apex, NC. You won't be disappointed. And now onto our Heart Winner. Carolyn of Draffin Bears! 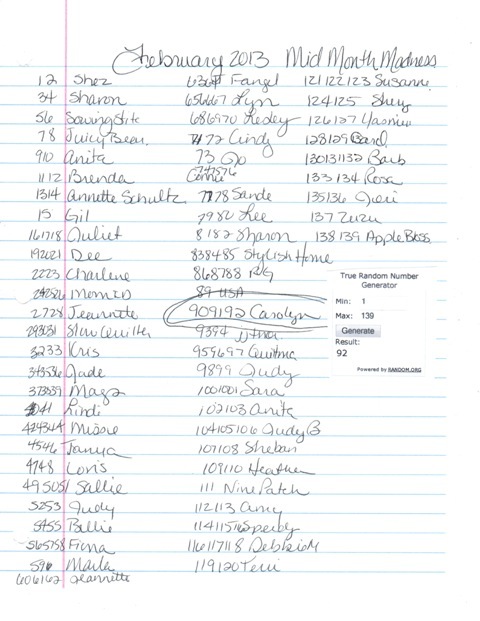 Congratulations Carolyn! I have your address, so I'll post your prize to you right away. The bunnies and I will see you right back here on Friday. It's Time! It's Time! For Mid-Month Madness! 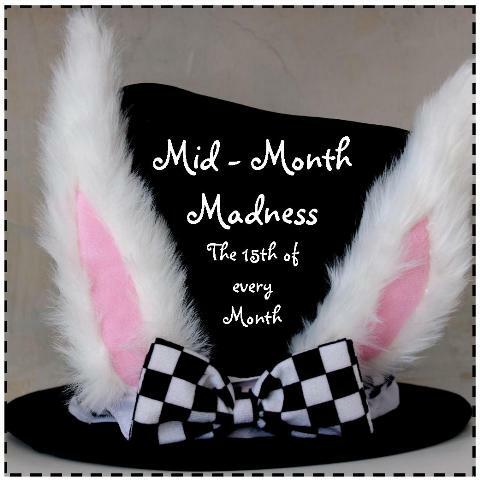 Hellooooooooooooooooooo and welcome to Mid-Month Madness! So this month, in the celebration of Love, I wanted to celebrate my love of stitching. I still remember the first cross stitch project I made and how proud I was of that completed project. I stitched all the time and made gifts for family and friends. My stitching love has evolved over the years, but the basic love of needle and thread will always be there. 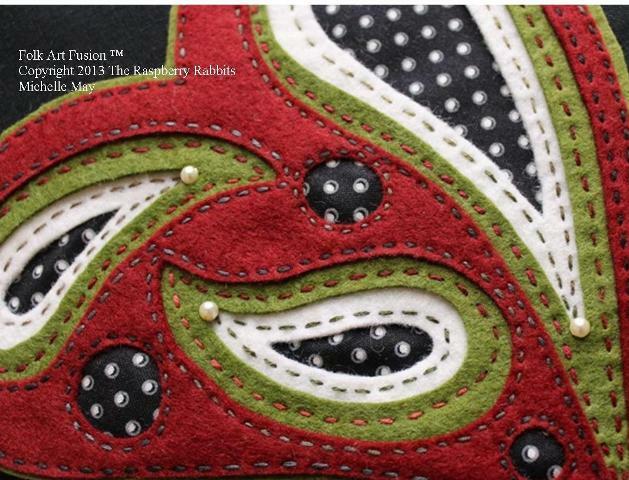 I decided I wanted to create a project and put together a kit to inspire others to start stitching. Have you always wanted to try? 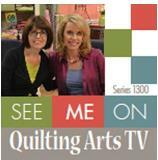 Do you have a special young person in your life that you would love to share your stitching passion with? Well, this is my Starter Stitching Kit. It has everything you need to make this heart hanger. Make it to hang on a door knob. Make it as an ornament. Make it just because it's fun! I have twelve kits available in my SHOP. But wait! I know some of you already stitch and don't need a kit, but might enjoy the pattern. Well, let's see. 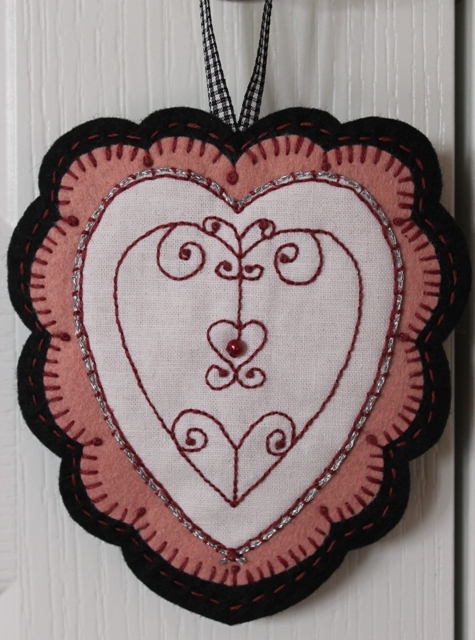 How about, any order placed in my shop over $10 until next Friday, February 22, will receive this heart pattern for FREE! Yep, free. What's that? You don't sew, you don't know anyone that makes things? 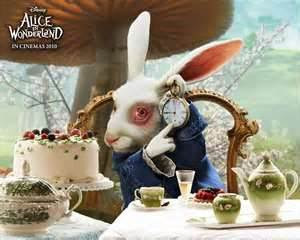 You pretty much show up here because the bunnies are cute, I'm crazy mad and you just can't help yourself? hee,hee,hee. Well, ok. How about a giveaway? Let's give away my original hanging heart! 2. Leave a comment on this post and be an official follower (signed up under followers on the side bar) = two chances. 3. Leave a comment on this post, be an official follower and Like my FB page = 3 chances! You don't need to leave separate comments. Doing everything in one comment is swell. 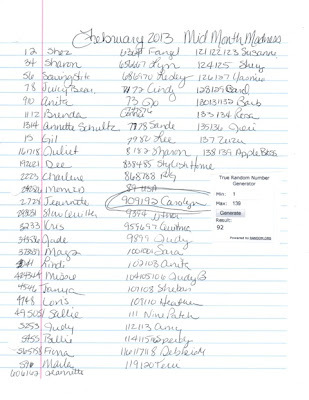 The bunnies will use the random number generator to pick the winner next Wednesday, the 20th. Ok, so now onto some madness and a little Hoppy Friday. Every morning, unless it's raining, I go for a 30 minute walk. I talk to myself. I look at the sky. I plan my day. I enjoy the air. I make random comments to various wildlife I pass along the way. I smile and wave to neighbors and school kids on their way to start their days. Well....I am not one for cold weather. I'm downright freezing until it hits 90 degrees! Plus I am, after all, a crazy bunny lady. When I found this winter hat, I knew it was perfect for my morning walks! 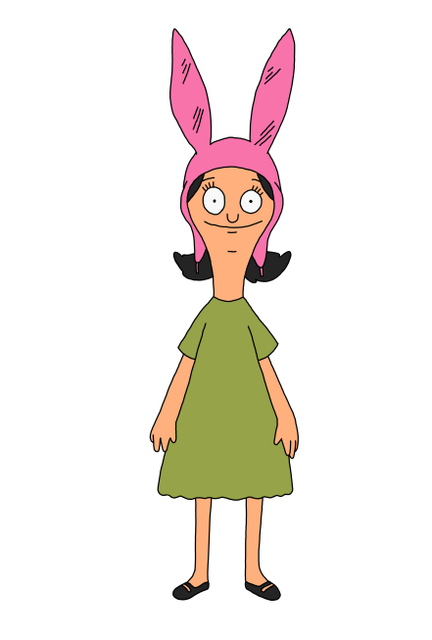 Then I got to thinking that Louise really is my doppelganger. My friend, Lydia, say's I look just like her if I am forced to try on a dress. Add a pair of black socks and yep...doppelganger for sure. Thus the reason I don't do dresses. What do you think? Hoppy Friday! Hoppy Mid-Month Madness and as always, your friendship is a treasured gift to me and the bunnies. We'll see you next Wednesday. Monday we have a few things to do like drive 2 hours with Lydia to go fun food shopping at Whole Foods and Trader Joes. Country come to town! Woo hoo! Happy Valentines Day from Bunnyville! Love is patient and will pet Hannah for hours if she wants. Love is kind and will take turns grooming each other. Love never ends because bunnies just melt my heart and bring joy to my life. Wishing you a very happy Valentines Day with your honey bunnies. See you tomorrow for Mid-Month Madness. Hi ya! I do hope you are having a fun week so far. It's been hopp'in around here. There are lots of new designs in the works and there is so much news that I can't wait to share with you! Oh how I hate waiting!! Anyway, until I can share the news, I wanted to show you what arrived from England! My wonderfully, talented, jewelry designer and illustrator friend, Joanne May, created these fobs especially for me. I wanted something special for my customers. I am a huge fan of Jo's work and own many pieces from her. Each is made with semi-precious stones. and, of course, the Bunny! These look super gorgeous on Bunny Embroidery Scissors! You can find the fobs and the scissors in my SHOP. Also, hop over and visit Jo in her Etsy shop for some wonderful jewelry, cards and more! Now for all of you who have become Lindsey Stirling fans like me and for those who love the magic of The Lord of Rings movies, here is a little bit of music for your mid week break. Enjoy. Helloooooooooooooo! Did you have a fun weekend? Were you snowed in? It was nice here in NC. In the mid 50's. Of course, I'm still freezing. I really don't warm up until it's in the 90's. 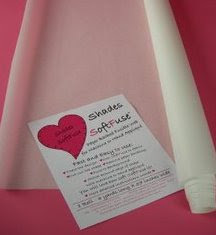 So last week I had two customers ask me if I sold National Nonwovens Wool Felt in bundles. I've been selling single pieces for the past year. I didn't have any bundles listed, so I spent the weekend playing and totally having lots of fun putting colors together and coming up with names for each bundle. There are eight 12" x 18" pieces in each bundle. It's fun to collect little pieces of pretty. I guess I'm a simple person. Pretty colors and bundles of possibilities make my heart sing. How about you? You ready? Ok...here's what's in the SHOP. I had mountains of wool piled up everywhere. It was so fun. The best part is I actually designed a Folk Art Fusion (TM) design in my head for each of the bundles. Have a fun day. Be creative. Be happy and know there are rainbows of possibilities in everything you do. We'll see you back here Wednesday.